Brazil GHG Protocol Program aims at encouraging corporate culture to elaborate and publish greenhouse gas emission (GHG) inventories, providing the participants with access to world-class instruments and standards. GHG Protocol is a tool used to understand, quantify and manage GHG emissions, originally developed in the United States in 1998 by the World Resources Institute (WRI), being the most frequently used tool worldwide for businesses and governments to elaborate GHG inventories. It also complies with ISO 14064 standard and with the quantifying methods used by the Intergovernmental Panel on Climate Change (IPCC). Among the features of this tool, are: it offers a structure to account for GHG emissions, it is modular and flexible, it is neutral when it comes to policies or programs, and it is based on a broad public consultation process. In 2008, the method was adapted to the Brazilian scenario by GVces and WRI, in partnership with the Ministry of the Environment, the Brazilian Business Council for Sustainable Development (CEBDS), the World Business Council for Sustainable Development (WBSCD) and 27 Founding Companies. 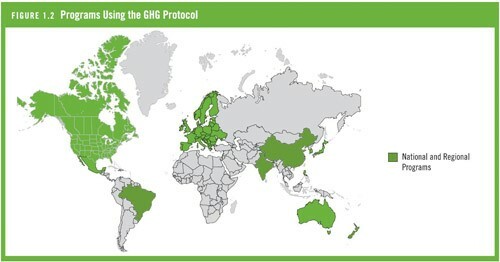 GHG Protocol method is applied in Brazil adapted to the context of the country. The Brazilian Program organizes working groups, along with the participating companies, to enhance the method and develop new tools to account for GHG emissions, according to the Brazilian reality. 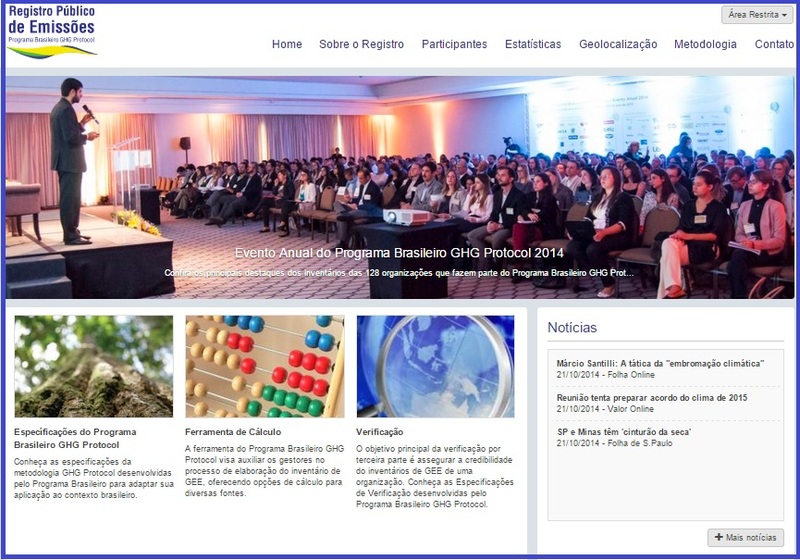 Although working groups, workshops for elaboration of GHG inventories and technical support are offered only to companies that participate in Brazil GHG Protocol Program, the method and its updates are available in the publications and on the website for use of any organization that might be interested in it. Besides, information generated in GHG inventories can be applied to the reports and surveys of initiatives such as Carbon Disclosure Project (CDP), Bovespa Corporate Sustainability Index (ISE) and Global Reporting Initiative (GRI). The Brazilian Program is a highlight among GHG Programs worldwide. According to Pankaj Bhatia, Director of GHG Protocol Initiative, ‘Brazil is a highlight for its growing adherence to GHG Protocol, its pioneer initiatives and the quality of the reports. You do not see that in China, or India, or Mexico', declared Mr. Bhatia during the Program Annual Event in August 2011. One of the Brazilian Program initiatives that is worth mentioning, considered pioneer worldwide, was the creation of the Public Emissions Registry; also, the public area for searching corporate inventories and industry statistics. In 2007, WRI and GVces submitted a project to the British government, with the purpose of deployment GHG Protocol Program in Brazil. The plan was to establish a culture of corporate inventories in the country, by transferring the method and expertise to calculate emissions, free of charge. The official launch of Brazil GHG Protocol Program was on May 12th, 2008, in Brasilia. On the 13th and the 14th, they conducted a workshop with the 27 pioneer companies that adhered to the program - the so-called founding members. Those companies helped shape, for instance, the training format, the work plan, and the tool adaptation to the Brazilian reality. In August that year, they conducted a workshop in which participating institutions presented what they had already produced regarding greenhouse gas inventories, and were advised on how to adapt their data to the GHG Corporate Standard. In the first half of 2009, additional companies were engaged, with the goal to publish the first Brazilian inventories in 2010. In June 2010, the first Brazil GHG Protocol Annual Event was held, in which 35 new corporate GHG inventories were announced, and the first Public Emissions Registry was published in Brazil. In 2011, the number of GHG inventories published and announced during the Program Annual Event increased to 77. Still in that event, they launched the public area of the Public Greenhouse Gas Emissions Registry and published the Verification Specifications.